Feelings about the Olive Garden -- "When my family went here as kids, we had an awesome waiter, he'd always give us free desserts and stuff." "Tricolor penne? That seems like a lot. Do you think they can get that down to a bicolor?" 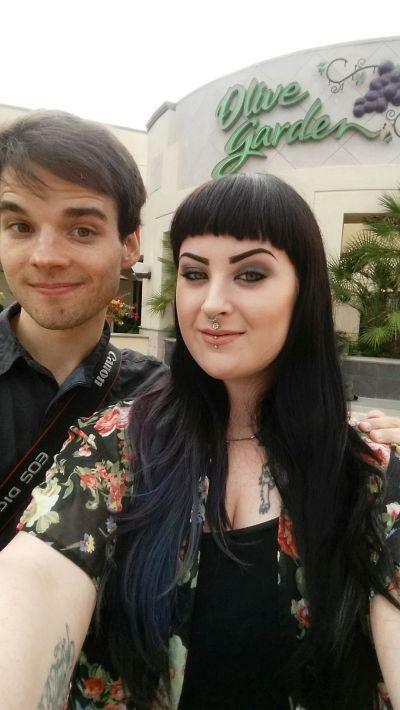 Lauren is an independent contractor (not a prostitute (not that there's anything wrong with being a prostitute)) who lives about an hour away from my Olive Garden, so before I say anything else I really want to thank her for enduring the horrible California traffic to spend some time with me. Granted, she did get Olive Garden food, which is a reward in and of itself, but I just wanted to put that out there. In addition to a love of cats and bats, Lauren has a special place in her heart for all things spooky and/or haunted. I don't know if that's just because it's October or something, but throughout the date I was acutely aware that both of our bodies were filled with skeletons, and it kinda freaked me out! 35 more dates to go.